Time and time again, gamers have been reminded that better graphics don’t necessarily make for a better game, despite the constant push for greater horsepower and aesthetics, sometimes even at the very expense of the gameplay itself. Few developers have proven this point more strongly and more consistently than Nintendo. Ironically, it is this same company that has, in a rare deviation from their normal practice, provided an example of this argument from the wrong side. Enter Mario Tennis: Ultra Smash for the Wii U, the latest foray into the world of Nintendo sports titles starring the iconic multi-talented plumber and friends. This game just lacks so much depth and feels so dull and uninspired, that I find myself wondering why on earth it was even made. It merely feels like a title that was rushed out there in a desperate attempt to fill the gap of a lacking Wii U lineup, buying a bit of time for Nintendo to regroup and start fresh with its next home console. Perhaps Nintendo still held out some hope for recapturing some of the former Wii audience, or even some of that N64 crowd, that appreciated simple and to-the-point arcade style gameplay. But whereas many of those multiplayer titles were rich in both content and overall enjoyment, the only real thing of value I felt I gained from this unnecessary sequel is that it has reaffirmed my long-held beliefs of gameplay mechanics, content, and fun reigning supreme over graphical horsepower. This is a gaming philosophy that the champions of this creed, Nintendo, seemed to have disregarded in this game. Though I was able to milk a little bit of enjoyment out of Ultra Smash here and there, especially with the split screen and online multiplayer, I had to search hard to find it, and it didn’t generally last long. 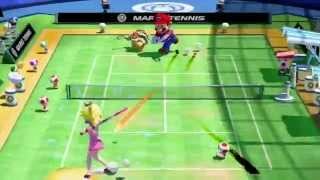 Even during the game’s brighter moments, I merely found myself yearning for the good ol’ days of Mario Tennis on N64, with its solid mechanics and simplicity coupled with subtle elements of depth, or even its less iconic Gamecube successor, which was absolutely brimming with features, unlockables, and unique game modes. Ultra Smash brings neither the simplistic charm that its N64 predecessor had already perfected, nor does it hold a candle to Gamecube’s Power Tennis when it comes to the quality or quantity of its content. In most aspects the game feels like a regression from these multiplayer gems, which is disappointing when you consider the fact that those titles are several years older than their HD counterpart for Wii U. In fact, the only elements in which Ultra Smash truly excels are its aesthetics, which are admittedly quite pretty (particularly the ice court with its impressive reflections and glistening textures), along with welcome inclusion of an online mode, which does manage to provide some much-needed replay value. The game’s features are about as bare-bones as Dry Bowser, yet not nearly as epic as he is. There is surprisingly no motion support to be had here, which is just one in a long laundry list of squandered opportunities in this game. And while the gamepad support is more than sufficient, the controller’s screen offers little in the way off additional features, and the Wii remote controls merely makes an already lackluster game feel even worse with its stiff and awkward control, courtesy of the d-pad. And although the game’s fun certainly ramps up when adding another player to the fold, at least one person will end up getting stuck with the Wii remote controls, which will likely diminish their enjoyment anyway. This NES style of controls simply does not work well with a relatively fast-paced 3D game such as this. Luckily this crisis can be averted if you happen to own a pro controller, which the game thankfully does support as well. Rather than relying on a motion control gimmick however, the game’s theme revolves around a rather dull and pointless gameplay gimmick - mushrooms that make your character larger. This is really the only new gameplay element brought to the table, which is disappointing since it doesn’t really offer much except frustration and unbalanced matchups. The name of the game for these “Mega Battles” essentially boils down to - hope to be the first to scramble to a mushroom power up that Toad throws at you at seemingly random times, and overpower your opponent to an overwhelming advantage that is difficult to overcome. Of course, the opposing player can answer by snagging a mushroom of their own (which usually occurs before the first player has shrunken back to normal) which means you’ve now essentially gone back to equal stakes, making the mushroom relatively pointless in this frequently occurring scenario. On the flip side, when you do have that small window in which only one player is mega-sized, there is a clear advantage granted, which is further enhanced when coupled with the absurdly over-powered “Ultra Smash.” In this scenario, unless the opposing player happens to be in the perfect location while frantically mashing buttons, it’s usually an instant point for the juiced-up player. 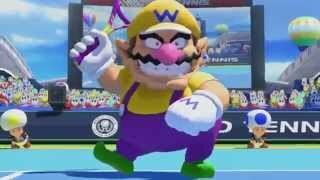 All lack of balance aside, it can be somewhat satisfying at first to launch some furious spikes and Ultra Smashes as your mega-sized character while knocking your poor smaller and more vulnerable opponent backward, as well as covering a comically large portion of the court with your increased range, though the novelty wears off rather quickly. The other core gameplay mechanic Ultra Smash revolves around is borrowed from the previous Mario Tennis entry on 3DS, known as “Chance Shots.” These essentially act as randomly-generated powerups, displayed by circular platforms that a player must rush towards, where they are then prompted to press one or two buttons from a series of recurring prompts. You are then granted an enhanced or otherwise altered behavior for your ball each time you land one of these sequences. This feature succeeds in some ways in terms of adding a little flair and color to the game, but it simultaneously shifts the focus away from tennis, and replaces it with a quirky mini-game vibe at times that lacks any real depth. These prompts tend to feel out of place and often change the game dynamics more than they probably should. As these seem to be thrown more at the player the more they are successfully executed, this inevitably leads to players spamming their way to victory by riding out and stringing together these powerups. This generally keeps the opponent on their heels and, like the Mega Mushroom, shifts things towards an unbalanced match, and often one that is difficult to come back from. This feature also feels a bit flawed in its execution, as the platforms are frequently placed well out of range of the player, making it difficult to react in time to scramble towards and land those awkward button combos during those particularly heated moments. These gimmicks aside, we are essentially left with yet another Mario Tennis game with HD graphics and a stripped-down online mode. Gone is any sort of fleshed-out tournament or campaign mode, replaced with the straight-forward and tedious “Knockout Challenge.” What you get is essentially a glorified sequence of matches against different CPU characters that get steadily more challenging as the game progresses. Aside from this slowly and subtly increase in difficulty however, there's no real feeling of progression, and it doesn’t take long before this mode feels monotonous. The seemingly random variation of different courts help to keep things at least a tad fresh, but most are just as dull as the game itself. The aforementioned ice court does look pretty, and there are some rare moments of excitement to be had with the chaotic Morph Court and Rebound Court, which actually affect the gameplay more than simply controlling the speed and bounce of the ball. Yet, the palette of stages are generally lacking in terms of distinct or memorable characteristics. Like the characters themselves, most of the courts are just sort of “there,” and don’t particularly stand out from one another. "There isn't much to "Love" about this tennis game"
Mario Tennis: Ultra Smash is ranked #1337 out of 1434 total reviewed games. It is ranked #103 out of 110 games reviewed in 2015.